(Jeddah) – Deputy Custodian of the Two Holy Mosques Prince Mohammed bin Salman bin Abdulaziz Al Saud has received at Al Salam Palace in Jeddah Shaikh Abdullah bin Ali bin Abdullah bin Jassem Al Thani. During the meeting, Shaikh Abdullah bin Ali stressed that the relations between the Kingdom of Saudi Arabia and Qatar are brotherly relations rooted in history. The Shaikh extended his mediation to open the Salwa border crossing for the entry of Qatari pilgrims to the Kingdom of Saudi Arabia’s territories, according to the official Saudi Press Agency (SPA). 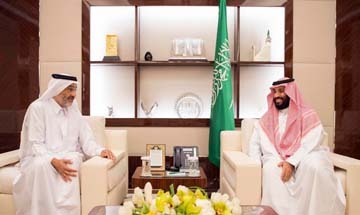 The Deputy Custodian of the Two Holy Mosques thanked Shaikh Abdullah bin Ali for his brotherly feelings, stressing the depth of historical relations between the Saudi people and the Qatari brotherly people and between the leadership in the Kingdom of Saudi Arabia and the royal family in Qatar. Custodian of the Two Holy Mosques King Salman bin Abdulaziz Al Saud has approved what was submitted by Vice Custodian of the Two Holy Mosques Prince Mohammed bin Salman bin Abdulaziz Al Saud on the entry of Qatari pilgrims to the Kingdom of Saudi Arabia through Salwa border crossing to perform Hajj, and to allow all Qatari nationals who wish to enter for Hajj without electronic permits based on the mediation of Shaikh Abdullah bin Ali bin Abdullah bin Jassem Al Thani. The king also directed that all Qatari pilgrims be transported from King Fahad International Airport in Dammam and Al-Ahsa International Airport as guests of himself within the Program of the Guests of Custodian of the Two Holy Mosques King Salman bin Abdulaziz Al Saud for Hajj and Umrah. The king also ordered the dispatch of a private aircraft belonging to the Saudi Airlines to Doha Airport to fly all Qatari pilgrims at his own expense to the city of Jeddah and host them completely at the expense of the Custodian of the Two Holy Mosques as part of the Program of the Guests of Custodian of the Two Holy Mosques King Salman bin Abdulaziz Al Saud for Hajj and Umrah, emphasizing that all pilgrims should be Qatari citizens, SPA reported.